Erbjuder samtidig varmluftsnitning av enstaka eller upp till ca. 200 st nitpunkter inom ett detaljmått på ca. 200 x 400 x 75 mm. Ideal för större detaljer med flera nitpunkter. Providing a processing area of 200 x 400mm, the 20/40 machine has capacity for larger part assemblies or multiple impressions of higher volumes. Lightguard protection, mobile stand and interchangeable tooling are all standard features on the 20/40 for ease of operation, production mobility and flexibility. 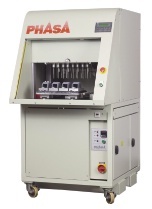 The machine will process all common thermoplastics – with or without filling materials. General Construction – Modular design with cast ground machine base-mounting plates. Electrical System – 220/240V a.c. 50/60 Hz – providing 24V d.c. control supply. Electrical Protection – Via RCCB and MCB overload trips. Pneumatic System – SMC valves and air cylinders with Origa rodless index cylinder. Temperature Control – Omron E5C3 Temperature control – sensing through K thermocouples. Heating System – 3,000W. energized by 28amp SSR – pulsed through Temperature Controller. Guard System – Light Guard operator loading bay protection & total enclosure of process cell. Documentation – Comprehensive instruction and maintenance manual. Nett Weight (excluding tooling) 200 kg. Electricity 3,000 watt @ 240 V a.c.
Givare för kontroll av detalj, läge, färg etc.